"The spectacle produces spectators and thus protects itself from being questioned; it induces passivity rather than action, contemplation rather than thinking, and precipitates the degradation of life into materialism ... in advanced societies, material survival is not an issue, except for those who are kept poor in order to represent poverty." - In his transactions with the public, The Beggar must avoid situations where he receives money out of pity. Money must always be part of the transaction: something is sold, something is told, something is made, something is done—and then you’re paid. - Money is never refused and is another element of the play. However, it goes without saying that money is not the objective, but a means to create a situation. - la dérive, le flâneur. - There are two main scenes, or two main ways of looking at "The Beggar". - One: as a real "theatre play", a theater play that addresses the public one by one. - Two: as an "observation post". 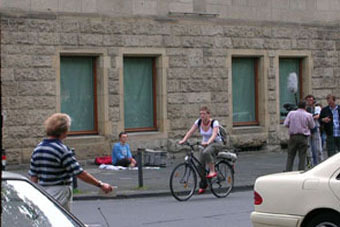 The position of The Beggar allows him to be everywhere, and report on everything. He must have a keen eye for the city, the exhibition, and the forces at play. Information can be actively sought out: the public can be interviewed. - How to react if someone identifies you as "The Beggar"? Only the situation can tell. For instance: if you get yourself in trouble (you are denied access to a certain place, or people refuse to talk to you), a possible strategy is to identify yourself as part of the exhibition, and see what reaction you get. But if someone is harassing you because you are part of the exhibition (by wanting to take pictures of you for example), you can decide to lie and deny that you have anything to do with it. NOTE: we met a woman from the magazine of the homeless in Münster, "Draußen" (meaning "Outside"), who asked us if we could do something for them —regarding the fact, that they are not allowed to sell the magazine in front of certain shops, because "it is bad for the public image of the shop". We agreed on selling their magazine in front of those shops and confront the owners with not allowing "The Beggar" to sell the magazine there, this is, not allowing a work from SPM07 to take place. There it goes our politically engaged moment. - In the scene known as "theatre play", The Beggar must always look for ambiguity. All the attitudes he assumes and situations he creates must have something strange about them. This is difficult and blurry, because reality itself is strange. Trying to sell money or tram tickets for more than their face value, or newspapers clippings, or adorning cardboard signs with fragments from Finnegans Wake, it’s all very strange, and yet I have seen it in reality. The important thing is to figure out a way to play with the public’s expectations, to use the strangeness to attract attention, to make the public believe that the reality you are creating is normal. 1 minute stories: the beggar gets to know some people in the surroundings, writes short stories about them, prints them out, and tries to sell them to their protagonists. yesterday's recordings: record the sound of a certain place, burn a CD and try to sell it. exchange shop: sell money or transport tickets for a higher price than their face value. yesterday's newspapers: sell yesterday's newspapers as an excuse to engage in a discussion about what is going on in the world. try to get money with one story, if it does not work, try another story (provoking the anger of listeners because The Beggar "doesn't stay in character”). ask for too much money: 20 euro. offer all sorts of information and assistance. ask for money in unexpected situations: the queue for the tram, the bus, the cinema, the theater, the bakery. Sit drinking beer at a bar and suddenly ask the person next to you for money. Or in exhibition venues. Or in design shops. 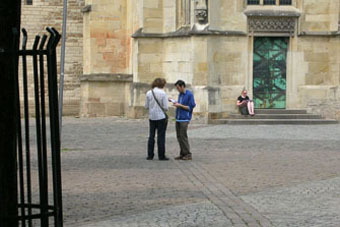 take part in guided tours of Sculpture Projects 07 and ask specifically to have the work "The Beggar" explained to you. Denounce contradictions or flaws in the explanation. - Never overact. Never give the impression that this is Straßentheater. The performance must always be very discreet, very self-contained, even if you are delivering a speech or singing in public. - Determine and be aware of the relation with the obdachlosen (the homeless) of Muenster. There is no question about it, your work is not an "infiltration work" - you must be open about the fact that you’re an actor with everybody, unless you have "theatrical" reasons to hide it. You don't have to pretend at any moment that you are a real beggar: you are using the role of The Beggar as a means to an end, and that end is not to look like a beggar, but to create situations and generate stories. "The artist has passed, by a slow process, from the state of entertainer - pleasantly occupying people's free time- to the ambition of a prophet."